It hasn’t quite been four weeks yet, but I’m already back to announce the availability of the final release of ControlsFX 8.0.0. This release is a combination bug fix and feature release, having gone through only one (proper) developer preview release (there was supposed to be a developer preview 2 release, but due to issues deploying the build we had enough time to fix up the remaining bugs / features and now we’re at the final release! 🙂 ). A huge number of bugs have been fixed, in particular related to dialog layout. It is highly recommended that people use JavaFX 8.0 b91 or above when running ControlsFX. This release of course includes all the features that were in developer preview 1. If you aren’t familiar with that release, be sure to check out the blog post for that release! Visit the bitbucket project to watch (or fork) the project. If you fork please consider providing pull requests so that ControlsFX continues to improve! The newly-added Actions API is used by both the dialogs API and the ButtonBar API. It essentially abstracts away the notion of how a control is represented, instead focusing on the properties of the control (e.g. text, graphic, etc). This makes it really easy to reuse the same Action in multiple places in your UI. We’ve also developed convenience API to convert Actions into the common UI controls (see the ActionUtils class for these methods). One of the goals of ControlsFX is to have high quality JavaDocs, so one of the main drivers for this release was to improve those further. As always, the JavaDocs can be read online, but they are also available as part of the download. 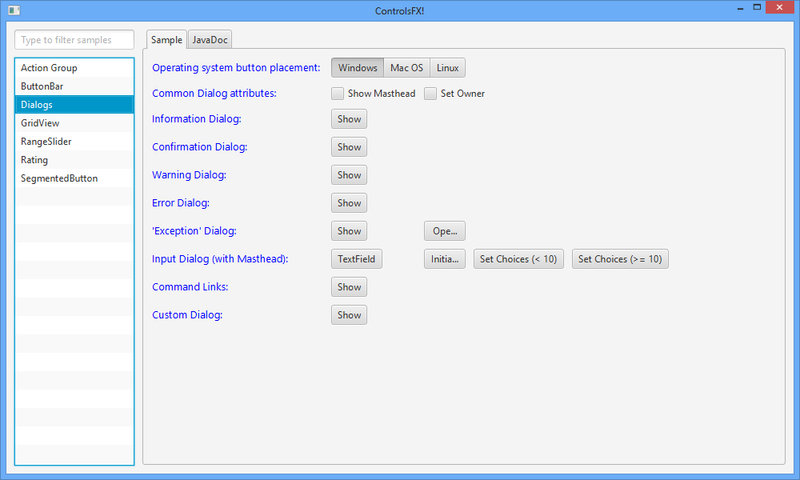 The intention is that the JavaDocs should be the primary way of people learning how to use the ControlsFX API, so there are good code samples and screenshots of the controls in action. Hopefully this will help to get people started quickly. Great. All my respect for it! I’m a bit late asking this question as the release has just dropped but is there any reason the modal dialog has to have a parent of a window? In the application I’m writing the top level component is a tab pane (like chrome) and I would like a dialog to popup and stop input in one tab say, but a user can still move to another tab and carry on in there. Very nice to see this library though, thanks. Good question. It is true that the owner can only be a Window (or null – an owner does not need to be specified). In fact, I’ve never actually encountered a modal dialog API that allows for modality of a single tab. Nonetheless, I’m not sure it is something I would like to bake into ControlsFX. I would suggest in your case having a custom dialog that effectively puts a glass pane across your tabpane content would be the best option. Make it gray and semi-translucent, with a lightweight dialog on top, and you should get a really nice effect. I agree that it isn’t standard behaviour, I was just hoping it existed so I could drop it in :). In my swing app I have something similar to what you have described. 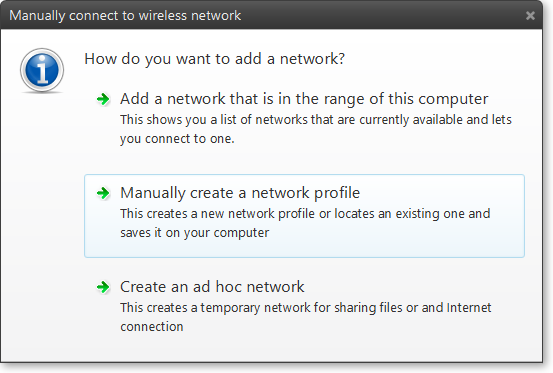 It was quick and dirty though and doesn’t allow things like dragging the dialog around the tab or resizing the dialog. JavaFX will make all this easier though so I’m sure it won’t be a problem to implement once I get onto that part. Thanks. I’ve started hacking on this in ControlsFX. That’s great. Let me know how you get on and I can try it out for you if required. I’m sure this is what you are thinking as well but what I see in my head at the moment is a dialog just like normal. Rather than this dialog blocking the whole stage, it just blocks whichever node you have set as the parent (in my case this will be the main content in my tab). The dialog behaves as usual apart from the fact that you can’t drag it outside of the parent node. 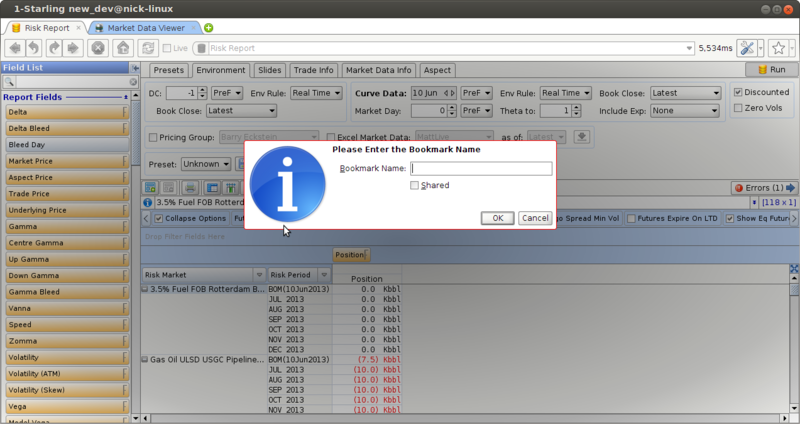 you can see that the current tab is blocked but I could switch to the market data view tab if required. @Nick: It is now available for testing in the ControlsFX repo. Cool. I’ve tested the lightweight dialogs and they are exactly what I had in mind. Thanks. I should add that such a feature would be a potentially welcome addition to ControlsFX, if you’re ever interested in contributing. I have problem with launching controlsfx-8.0.0-samples.jar. How are you attempting to start the samples application? Using the following command? If that doesn’t work, replace the colon between the two jar files with a semi-colon. Problem solved: after replacing colon between the two jar files with a semi-colon. Path separator for Windows is semi-colon, yes. for ‘Exception’ Dialog: button click Ope… and button click Open exception – performance scrolling – slowly, click + (maximize) – slowly rendering window – not full screen. Is possible resizing of window? If it is slow then perhaps your machine is running JavaFX in software renderer rather than using your graphics card. JavaFX 8.0 does not support this graphic card -> software renderer. Scrolling is basic feature – Why is need super graphic card? JavaFX 8.0 will support Windows XP? If not can we see a release for that anytime soon? Since 3D is making a HUGE PUSH into FX now, we need to make sure everything can support 3D. I’m not sure where you see that GridView uses ListCell – it doesn’t, it uses GridCell. In any case, review the API here: http://jonathangiles.net/javafx/controlsfx/javadoc/ You’ll see that any Node can be set inside a GridCell, including 3D. Sorry I meant GridCell, It says ListCell on the first line of the api, so that’s why I said it by accident instead of GridCell which was 5 words later 😛 I checked out the API, I just wanted to be sure 3D works(as some things don’t work with 3D yet), thanks!